Consciousness, awareness, being present, or of course- “Woke AF” — all of these terms really refer to the practice of mindfulness— but what does that even mean, really? From Hollywood celebrities to your local yoga teacher, mindfulness is the new black. Never goes out of style and complements everything. Once considered an esoteric concept from a foreign land, mindfulness has hit the mainstream. So what is this ancient spiritual practice that has suddenly gained traction in 21st century America? You will hear “awareness” and “mindfulness” being used interchangeably, but this is a mistake. When we do things mindfully, we are doing more than simply being aware of them. Mindfulness is the act of paying attention on purpose. Being aware that you are praying is very different than praying mindfully. Eating mindfully is different than just being aware that you’re eating. Anyone can be aware that they are doing something. All it requires is the barest attention to what it is that you are doing. However, doing something mindfully means being fully involved and present in that very moment. Let’s examine this a bit further, using running as an example. If we are running mindfully, we are aware of every sensation that our body feels. The pressure in our midsole as our foot strikes the ground and presses off. The contraction of our hamstrings as we power up a small hill. The smell of the forest after a hard rain, and the rhythm of our own breath. Our mind is 100 percent in the present moment. We are not thinking about the groceries we need to go get, or the presentation we have to give at work in two days. We are breathing and running. That’s all. To maintain this level of consciousness at all times, in all things, is mindfulness. Experiencing this high level of consciousness is incredibly liberating. It is an emotionally non-reactive way of being. That doesn’t mean that the emotions are turned off somehow, or that we ignore them in order to not react negatively to them. Quite the opposite. Being mindful enables us to become aware of an emotion, notice what it is doing, and then letting go of it without judging it or reacting to it. This is a very useful way to overcome depression and anxiety, two conditions that are becoming more and more common in our consumer-driven society. Everyone possesses the ability to instantly become mindful. In fact, you have probably already done it. Have you ever been in a car wreck or serious accident? Held up at gunpoint, or fought in a battle? Received a call that your child is in the hospital? Any of these situations will instantly slam you into the present moment and keep you there until they are resolved. Fortunately for our sanity, there are softer, gentler ways to achieve this state. To understand the difference between mindlessness and mindfulness, think about sitting in the most boring class you ever had in school— like one of those weekly 3 hour lectures in college about mathematical theses. You’re one out of 100 students sitting in the classroom- and the professor is going on, and on… What are you thinking about? Are you tuning out the lecture while texting, scrolling through Instagram, thinking about whatever you did last night? Or, were you engaged in the lesson, were you present & focused on the lecture- actively taking notes and aware of the key points? Being mindful means to be fully in the here and now— it’s being focused & engaged in the moment. 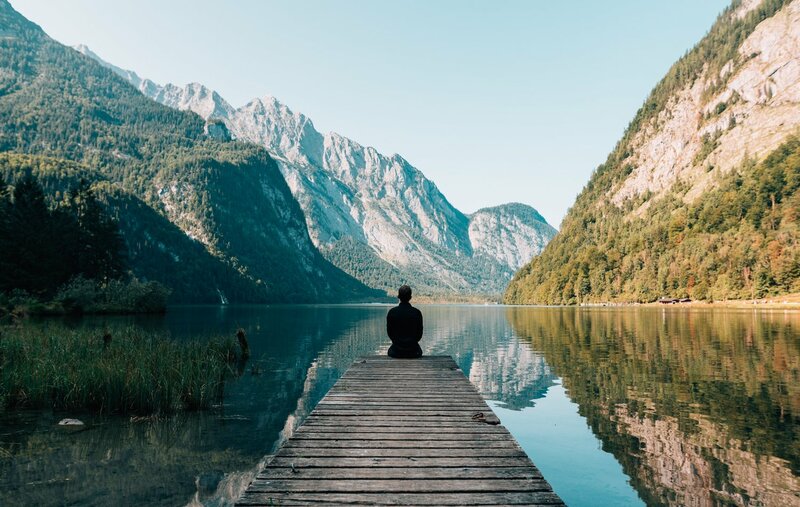 Practicing mindfulness doesn’t just mean a better GPA — consciousness benefits the entire mind-body-spirit continuum, it reduces stress, stimulates creativity, and even increases gray matter in the brain…aka it makes you smarter. Sound a lot like meditation? Although mindfulness is a form of meditation, it doesn’t require sitting cross-legged in silence, staring at a candle, or any chanting of Om. Mindfulness is a living practice, applicable to any and every area of day-to-day life. Whether you’re a seasoned vet or a beginner, give these mindfulness practices a try— just remember, it’s a practice! The simplest way to get to this state is to begin a daily practice of meditation. The actual practice is pretty simple. Sit in a quiet room with dim, ambient lighting. You can sit in a chair or on the floor. If you feel like you meditate better with a pillow underneath your sit bones, then use one. The important thing is to feel relaxed and comfortable and have a straight, tall spine to allow your lungs to expand. Now, breath in slowly through the nose and out through the mouth. Count your breaths to 10, then back down. If the mind wanders (and it will) gently return it back to the counting of breath. Start with 5 minutes daily, then work your way up to 10, then 20 or 30. There are also guided meditations that you can find online that are very useful. If you live in or near an urban area there will be meditation groups and yoga studios, possibly even a Zen or Buddhist temple. The possibilities are endless, yet the actual practice is simple. Start small and expand. Find a teacher for when you get more serious. And remember to practice daily. Just because you may be quiet while someone is talking, doesn’t necessarily mean you’re listening. The mind is a powerful thing, easily distracted and distracting. Often we can be in conversation with someone, or even on the phone, and not really paying attention to what it is they’re saying. Our minds are busy, thinking of the next thing to say- or thinking about something else entirely. Stop thinking! Quiet the mind, and actually listen to what they’re saying— just listen. Turn this into a 5-minute meditation— close your eyes and listen to what’s around you. Become aware of a sound— then let it go & move on to the next sound. Perhaps the coolest sounding mindfulness practice, urge surfing helps you “ride the wave” and kick any bad habits. Late night junk food cravings derailing your health goals? Surf the urge! When those cravings strike, don’t panic- recognize it as a craving & know that it will pass. Experience the urge and how it may change by the minute. Notice how it may intensify and then perhaps dwindle…. Experts believe the majority of food cravings only last for about 3-5 minutes… push your willpower and ride it out! The practice of mindful eating seems to be as buzzword heavy as keto but, this one’s not a diet! Shut off all the screens and put the phone down, being mindful while eating means no distractions. Instead of mindlessly devouring your meals while multitasking, use your senses to stay present in the moment. Slow down, experience how your food looks, how it smells, and of course how it tastes. Become more aware of each bite — maybe even incorporate whatever it is they say about how many times we should chew! The art of savoring your food can actually help you absorb more of the nutrients! Bonus, mindful eating can even curb those pesky cravings! As you progress, take your mindfulness to the next level— think about what went into preparing your meal, the people involved in growing and harvesting the ingredients, what went into purchasing and production of the food, and what’s the source of each and every ingredient on your plate. Implementing this strategy will not only help you be more grateful for the abundance of what we have, but also help you make more informed decisions about what you choose to consume for your health and also for the planet. The liquid crystals that are used in mood rings change in response to temperature— which of course is meant to change according to our mood. While we’re probably self-aware enough to know how it feels to be happy or upset, the visual aid serves as a reminder to be aware. Practice Mindfulness by observing your emotions & how that may be impacting your behavior. So there you have it...our tips for experiencing life as it was meant to - awake, aware, fully present, and mindful. Put these five tips into practice and you’ll be amazed at all the subtle details that you begin to experience in life all around you. Suddenly you’ll notice things you never paid attention to before that were right in front of you all along! Having trouble getting in the groove? Check out our 21-DAY LYFE TRANSFORMATION program. It will help to instill all five of these mindfulness tips using a holistic approach to health and wellness. Become More Mindful in Every Facet of Life!